Some of you may remember this strangely beautiful sky. There was an exact same sunset on August 1999. Someone I know refused to come out of his house for 3 days, thought it was an omen. 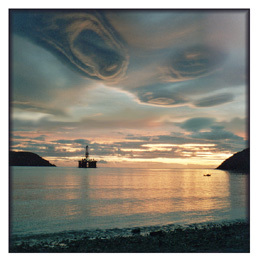 I well remember as a young boy growing up in Cromarty - it had some beautiful and unusual sunsets and sunrises - it seems you still have them!! When I saw the shapes appear in the sky, it looked strangely alien to me, like something you would see in a science fiction movie. Methinks Iain has been conning us - see picture #644. If you think these pictures are weird my mum, Annie Ratcliffe, has even better ones from that night! !